Reintroducing the Grade 3 Granblue Beatstick from this set. [CONT](RC) Generation Break 1:If the number of cards with the hollow ability in your drop zone is four or more, this unit gets [Power]+2000. Then, if this unit is hollowed, this unit gets [Power]+2000. 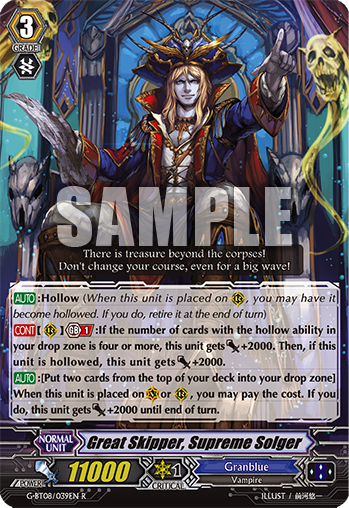 [AUTO]:[Put two cards from the top of your deck into the drop zone] When this unit is placed on (VC) or (RC), you may pay the cost. If you do, this unit gets [Power]+2000 until end of turn.